The Short and Tragic Life of Robert Peace: A Brilliant Young Man Who Left Newark for the Ivy League (Compact Disc) | Let's Play Books! A heartfelt, and riveting biography of the short life of a talented young African-American man who escapes the slums of Newark for Yale University only to succumb to the dangers of the streets--and of one's own nature--when he returns home.When author Jeff Hobbs arrived at Yale University, he became fast friends with the man who would be his college roommate for four years, Robert Peace. Robert's life was rough from the beginning in the crime-ridden streets of Newark in the 1980s, with his father in jail and his mother earning less than $15,000 a year. But Robert was a brilliant student, and it was supposed to get easier when he was accepted to Yale, where he studied molecular biochemistry and biophysics. But it didn't get easier. Robert carried with him the difficult dual nature of his existence, "fronting" in Yale, and at home. 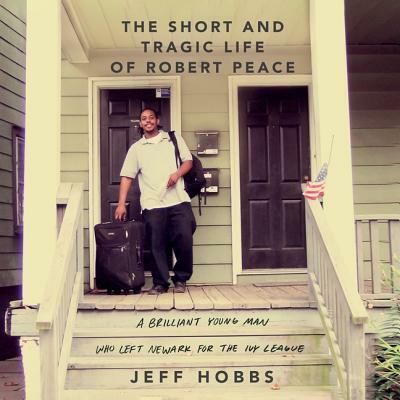 Through an honest rendering of Robert's relationships--with his struggling mother, with his incarcerated father, with his teachers and friends and fellow drug dealers--The Short and Tragic Life of Robert Peace encompasses the most enduring conflicts in America: race, class, drugs, community, imprisonment, education, family, friendship, and love. It's about the collision of two fiercely insular worlds--the ivy-covered campus of Yale University and Newark, New Jersey, and the difficulty of going from one to the other and then back again. It's about poverty, the challenges of single motherhood, and the struggle to find male role models in a community where a man is more likely to go to prison than to college. It's about reaching one's greatest potential and taking responsibility for your family no matter the cost. It's about trying to live a decent life in America. But most all the story is about the tragic life of one singular brilliant young man. His end, a violent one, is heartbreaking and powerful and unforgettable.